Life Mel Honey is the result of over thirty years research and has been specially developed to provide the recognised health benefits of pure honey in combination with specific therapeutic herbs and other natural ingredients. 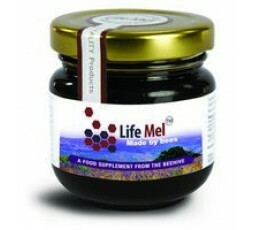 Life Mel Honey is produced from bees fed on a special food mixture which enables them to make a unique form of honey with all the beneficial properties of the therapeutic herbs and natural ingredients. This honey is specially produced in a controlled environment which guarantees a pollution-free pollination process. Other than collecting the honey from the hive and packing it, the honey is not artificially treated in any way and no ingredients are added after extraction of honey from the hive. Life Mel Honey uses nectar derived from therapeutic herbs including Siberian Ginseng, Echinacea and Uncaria Tomentosa, combined with a selection of natural ingredients including iron, protein and vitamins. 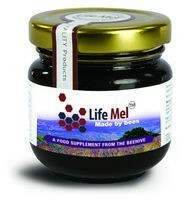 Life Mel Honey has a distinctive and pleasant flavour and aroma. Two 5g teaspoons a day, one in the morning on an empty stomach and one in the evening. The honey should be sucked slowly.